We had been Blessed to have Eric's grandpa around for 84 years. He was a Wonderful man, and he will be so missed. But God and Grandpa had their own plans. Grandpa's body had been falling apart for a while. Grandpa fought a good fight. He had been on dialysis for years, and had CHF too. And when Grandma passed away last year, we thought since he would only be taking care of himself, it would be less stress. It wasn't though. The last few months, whenever he got his dialysis, he would get sicker. Just as he'd recover enough to go home from the rehab facility, he'd land in the ER again. It was a vicious circle. One that Grandpa hated. Eric and I had often said, the day Grandpa could no longer drive was the day he'd be ready to go. And he was having those days, where he couldn't get out, where he had to have people help him. Grandpa was a strong willed and independent (in case you every wonder where my boys get it, they got it double both sides!) and to not be so was not good for him. He made the decision in mid-May to stop dialysis. The decision brought Peace to him, but great sadness to the rest of us. But Grandpa had Better Places to be. I can't blame him for that, for if I reached the point where this world brought too much pain, I too would want to go be with Jesus and the rest of my family who has gone before me. We just knew we would miss him. The last couple weeks have been so hard for all of us that loved him. First Mom went down to Florida, so she could be with him, as soon as she could. We didn't think he'd last long after he stopped dialysis. But it seems, that although Grandpa's body was giving him trouble, it hadn't given up the fight, and though his heart and mind were ready to go, no one had given the memo to his body. So he hung on for almost 3 weeks. What a Blessing that was too. For Ryan and Eric both were able to fly down for a couple days to give their farewell hugs in person. I know, it sounds crazy, we just had a baby, we now have 3 children, and we let Eric skip town for a couple nights. But as it turns out, I was better recovered than I thought. And my big boys were so good they helped me out a lot. It was Good for Eric to go where his family needed him, for they needed him too. And even better that he could be there in person to give love and sending thoughts and prayers in person when the words just don't come to us here at home. I had a lot of trouble putting together the words I wanted to say. I just kept going over pictures of our good times spent together. Like this one, when we'd stopped into Florida last fall, and had lunch with Grandpa on our way to Club Med. I was only a little bit pregnant then, just starting to feel ill. I'm so Thankful we stopped, and the boys got to be crazy with their Great-Grandpa one more time. We got to stay in the park for a few days with them when we were in Florida in 2010, I love this snuggly picture of Chris and Grandpa after we'd been in Sea World all day. Chris got sick about 5 minutes after this picture was taken, think it was probably dehydration. But Grandpa was a champ, didn't mind at all. And in 2009 we got to have lunch with both of them when we came to Disney World, and he got to meet Sam for the first time. If there are perks to such sad occasions, they are that we get to spend Quality Time with Family. Going up to Marion for Grandpa's funeral was a wonderful opportunity for us to introduce the family to Jacob. I had more than one person greet me in a hug with "My Congratulations and Condolences." And it seemed to be a life full circle, to have the Joy of a new life surrounded by the ending of another. Just like his brothers, Jacob brought peace to aching hearts, and unconditional love to those that were hurting. He's good at that. Just like his brothers. As crazy as it is to have all three little boys at a funeral, it was good for my heart to have them there. Aunt Teri got to meet Jacob. And Jacob got to be tight with Jeremiah. Looks like Jacob may be catching up in length, but Jeremiah is Way Ahead on the weight curve. And aren't all these boys So Handsome?! During the viewing, a long 4 hours, Aunt Jan had set up a DVD player in the lounge of the funeral home, the kids lasted about 15 minutes in the parlor before wanting to go, to play, to be anywhere else. We set them up in the lounge, and they happily watched movies for hours. Brilliant. Aunt Jan also got to get her cuddles with Jacob in too. After the viewing, we met in the hotel lobby, and ordered pizza. One of Dad's Willman cousins was in charge at the hotel (gotta love small towns) and let us take over. There was pizza and snackage and drinks, and talking. But then the kids got to blithering, and they all needed to go to bed. After the littles were down, Eric went back downstairs to tell stories. My favorite of these stories was that James Dean used to "hang" around one of the garages that Grandpa worked. He was a hot rod enthusiast. It got me to thinking, Grandpa was Cool, before Cool was cool. James Dean was a "hanger", meaning he hung out, mooched, a wannabe, if you will. Yeah, Grandpa showed James Dean how to be cool. That is Very Cool to me. I almost forgot, at the end of Viewing, they had a Mason service. Grandpa was a Master Mason, and had gone up the Scottish Rite mason chain. I forget his exact title leadership role, but at one time Grandpa had literally been the Grand Pooba of the Marion Masons. For Grandpa, one of his Brothers in the bond played the bagpipes for his Mason service. He played Goin' Home/Amazing Grace. I didn't know Goin' Home was a song, I knew it as the New World Symphony. I used to sing a little song of it for Chris as a Lullabye - but apparently someone else borrowed the same largo theme and wrote a song, Goin' Home. And I got to hear it on bagpipes. The tears just leaked down my cheeks. It was Beautiful. A perfect tribute. The next day, I had a Job at the funeral. Mom asked me if I would read the letter that I wrote to Grandpa. I had had some trouble finding the proper words of farewell. 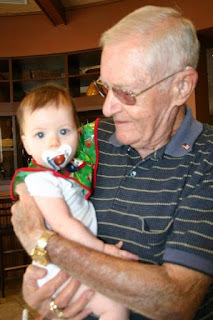 I couldn't pull the words in my heart out, when I heard Grandpa had made the decision to leave us, for him to Go Home. It took me the better part of the two weeks he hung on, to put my emotions into words. I wrote this and finally got it emailed it to him, on the day that Eric flew home. Only Mom and Aunt Teri read the first sentence and couldn't read it any further. They asked the helper nurse to read it. Only she couldn't either...at first, but then God sent her a Sign, and she was able to pull it together. So, I'm putting it here too. I've been Struggling to find the words to convey my feelings about the situation. But the words that just keep coming back to me, that I just Need to say, are I Love You. I was not Blessed growing up with Grandfathers that were as open and loving as you, you showed me love from the very first time I met you...just like your grandson. He shows that same kind of sweet love too. You made loving look easy. I was not used to all those hugs! There aren't many men that can and do, and yet you have Blessed your whole family with your loving nature. I'm Thankful that we got to spend time with you as often as we have. I always loved it when you guys came to town, or when we got to go visit you. I'm especially glad we got to stop in and have lunch with you last fall. I'm Thankful that my elder boys got to meet you and get to know you. Even last night, Christopher if you were having dinner at the table where you would eat with Grandma when you were alone. He remembers your home. And I know he remembers you. And we'll make sure he always does, that they all do. Every time I look at my husband and my sons, I see you. They all have your chin. And they have the same sparkle in their eyes. And the same great humor and love of telling a good story. I will miss your smile and your hugs, and your laugh. But this is not a sad time. What a Blessing that we actually get a chance to say goodbye, a rare opportunity to tell you all the things that we think all the time, but never say. I'm sorry you've been suffering, and though we all will miss you terribly, we understand. You have Better Places to be. Go then, and Be at Peace, and know that we all love you. As it turned out, I wasn't able to read it aloud without crying during the service either. It was Beautiful to me, that I got the opportunity to read it to him in person, even though it was only to his heavenly ears. It was a Beautiful service, a fitting way to say Farewell. After the Service we went over to Aunt Betty's church, where we often have Willman extended fests. This last photo is a bit blurry, but I loved it. I was too slow to get my camera out. But Chris and Cameron (who is his 2nd cousin, aged 4, but as tall as he is) were holding hands when we walked in to the luncheon that Aunt Betty arranged. Chris kept saying that Karen (Cameron) was his friend, and she was calling him her best friend. They played, they loved each other. Once again Jacob brought smiles to people, so it was Good for us to all be there, even with our own special brand of crazy. We left shortly after lunch, for we were all tired, sore, and sad, but it was Good to be together. There's something Good about spending time with family, to laugh and cry together when we lose someone. And we were Blessed by that time together too.